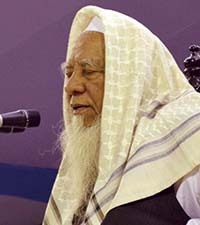 Ahmad Shafi, is the Islamic scholar of Bangladesh. He is the present rector of Al-Jamiatul Ahlia Darul Ulum Moinul Islam Hathazari, Chittagong, Bangladesh. Ahmad Shafi Saheb is one of the greatest disciples of Husain Ahmed Madani. He was born in Rangunia, Chittagong. He received his primary education from his family. Then he joined Al-Jamiatul Arabiatul Islamiah, Ziri and spent five or six months there. Finally he took admission at Hathazari Madrasah in 1361 Hijri (1942) at the age of 10. In Hathazari Madrasah he studied for 10 years. Then Shafi went to Darul Uloom Deoband for higher studies in the field of Hadith and Tafsir. He studied there for four years before returning to his homeland. Ahmad Shafi commenced his career as a teacher at Hathazari Madrasah. In 1407 Hijri (1986), he was elected honorable rector of Hathazari Madrasah. Shafi is also the present chairman of Bangladesh Qawmi Madrasah Education Board. Very interesting life story, reading it carefully I am very impressed but I also have some questions in my mind. Why all those years are mentioned only in hizri calender? Those of us not as well verse in Arabic yearly calender would be helped if Bengali or English years and dates. My second point is it seems he lived on gift or charity throughout his life without working in usual sense like ordinary people? Lastly Is he and his followers are any way worried about earning their livelihood if every one become knowledgeable about Islam? Alhamdu lillah , I like this person . Going on we are stay with you as per as possible . "দেশে যদি ইসলাম না থাকে তাহলে আমাদের বেচে থেকে কি লাভ"
"যত চেষ্টাই করা হোক ইসলামকে কেউ নিশ্চিহ্ন করতে পারবে না। যারা ইসলামের বিরুদ্ধে ষড়যন্ত্র করে তারাই একদিন নিশ্চিহ্ন হয়ে যাবে"